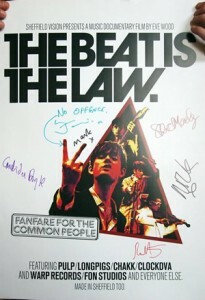 Here is a reminder about your chance to enter a prize draw and win a very collectible The Beat is The Law film poster designed by The Designers Republic incorporating the iconic ‘Kes’ two fingers Jarvis image and remarkably signed by all the members of reformed Pulp including Jarvis Cocker (No Offence), Candida Doyle, Steve Mackay, Nick Banks, Mark Webber and Russel Senior. Here’s how to enter: Purchase a Streaming rental of The Beat Is The Law film (90 Mins) or the film plus extras (120 mins) or the Spanish subtitled version from our on demand distrify video player here, and you will automatically enter a prize draw. One lucky name drawn randomly from those who have purchased our GREEN button items will receive this exclusive signed poster. 10 other lucky names will also be drawn who will each receive a fabulous film poster each (signed by the film’s director if you want). 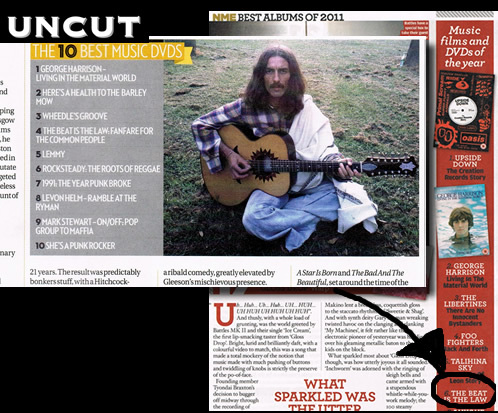 Last day of entry for the draw is the last day of Pulp’s 2012 tour (23rd December).